Welcome to Sake Japanese Steak House & Sushi Bar, located in 4470 Indian Ripple Road, Beavercreek, OH, where we provide Japanese food. It's Not Just Dinner, It's Entertainment! Enjoy an enchanting evening out, when you dine at Sake Japanese Steak House & Sushi Bar in Beavercreek, OH. 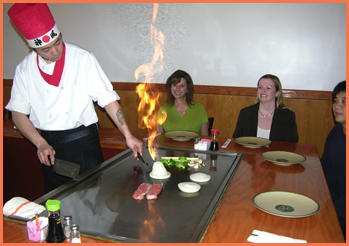 Be entertained at our Hibachi Bar while indulging in a variety of exquisite and unique taste experiences. Find out why Sake is an Imperial Pleasure! We carry a vast array of Sake, which is sure to appeal to your quest for culinary experiences that are memorable. Served hot or cold, Sake is always sure to please. Call or come in to take advantage of our senior discounts. We offer military, student, and senior discounts of 15%; you must show the proper ID. Reserve your table for your next gathering of family or friends at Sake Japanese Steak House & Sushi Bar, in Beavercreek, OH. Call now!